It’s time for the gripping climax of the spring-town trilogy. Let me tell you about a waterfall and spotting crimes. Last time, I mentioned all the mysteriously empty buildings on the way to a holiday location. As the title suggests, we arrived at the region of Călimănești. Hello friends! Last time, I talked about the Edinburgh Dungeon and the spooks therein. That same day, my companion and I also visited Edinburgh’s Camera Obscura and the World of Illusions. This place is located near Edinburgh Castle, which means I’ve walked past this place many times before without going in. I never really knew what was going on with it, from street level it always seemed like it was fairly insubstantial. This time though, I suggested it as a location sorta half-heartedly, then took it more seriously when I looked up their website and they promised ‘6 floors of interactive hands-on fun!’. I don’t know about you guys, but that sounds like a lot of fun to me! I do like optical illusions and things, so we decided to go for it, once again not having any particular idea what was inside. I mean, yes I expected some illusions, but I like to be surprised so I didn’t spoil anything by looking too hard at the website. I didn’t know what was going to be on any of the floors, and honestly I didn’t even know for sure what the Camera Obscura part of the name was talking about, it might’ve just been a cool-sounding name. Or it might have actually been the magical camera from the Fatal Frame series. Nooooooooo I’m too young to die! Fortunately for my sanity it is not in fact based on spooky Japanese video games. So what is it? What is the Camera Obscura? The Camera Obscura itself refers to a really neat device on the top of the building that projects images onto a table. Using nothing but mirrors and daylight, the operators of the camera are able to look all around Edinburgh, from viewing the skyline to the people walking around. If there’s a straight line of sight to it, the camera can look at it, since the mirrors apparently can look around 360 degrees. You actually start off by going straight to the main event here, climbing to the top floor of the building right away. There is some flexibility here, but it’s probably best to just head up there and work your way back down so they can manage how many people are in the special room at a time. While you wait for the staff person to usher your particular bunch of people in, you can go out onto the rooftop area and look at Edinburgh with your naked eye. This is quite nice! Anyway, this demonstration of the Camera Obscura doesn’t actually take too long. The friendly staff person explains the system and how it works, with everyone circled around the table in the dark room. It was quite interesting to me, even if it’s not mind-blowing or anything. The best part is where they hand out plain pieces of card, and you get to interact with the table projection a little bit. There’s something innately amusing about using the cards to ‘lift’ random clueless people on the street below into the air. Or maybe that’s just the tyrant in me. There is one major point to remember however. This device operates using nothing but sunlight. Thus, the later in the evening or cloudier the day, the less you will see. I entered on the last showing on the day during a dull day, so things were juuuuust good enough. This is something that is mentioned a little bit on their promotional materials, but if you are going during winter, try to get in during the brightest part of the day otherwise there will be nothing to see. The rest of the place has floors with some loose themes. If you’ve been in a place with optical illusions before, many of them will be familiar to you. There’s a floor with those holograms that move when you move from side to side which are excellently done. (I did appreciate that they warn you of a giant spider hologram for those with arachnophobia!). There’s a Magic-themed floor with things that work best with a friend, allowing you to seem to swap eyes with each other and the expected body-warping mirrors. There’s a floor with some Edinburgh-themed illusions and historical things which are neat. There’s an area with the ever-popular electrical things that zone in on your fingers when you touch them, making you look fabulously evil. They probably have a proper name, but I don’t know it and I’m not about to learn now! 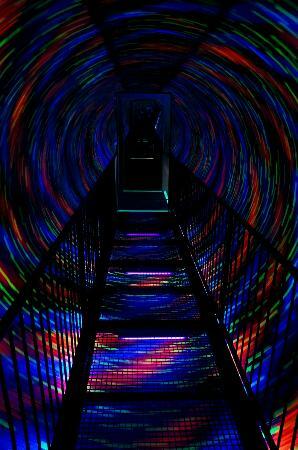 There were several excellent areas which amused me, but my favourite part is the Vortex. In this section, you need to walk across a small bridge in a darkened room, while lights revolve around the bridge. As in, the whole floor/ceiling/walls combination is one giant revolving tube of lights, as if you’re a tiny person walking through the inside of a used revolving toilet roll that’s been painted a bunch of diffe-wait wait wait, I’ll just show you. See, just like I said. In a still picture this looks like nothing special, but the second you start walking through here your brain is terribly confused, and you start uncontrollably falling to the side. I love it when an illusion messes with my brain despite knowing exactly what’s going on, and I spent a fair while walking up and down this part, trying to use my force of will to walk smoothly. I did okay after a while, but it’s best when you’re watching other people walk it from the safety of the sides. You’ll see your friends cling to the guard rail for support like they’ve been shot in the leg, and wonder such scientific thoughts like “I wonder what would happen if I put a dog in here? What about a toddler?” Ahh, mad science. Ahem, where was I? Oh yes. My other favourite things were the trick perspective rooms, and the thermal imaging room. In this room I finally got to see evidence that I am actually made of molten lava compared to most other people. I also particularly liked the tiger box for something unexpected. I have been giving this place a glowing review so far, but it’s not perfect. If you’ve been to similar illusion places before, there will be many things that provide nothing new. Several of the exhibits seemed to be non-functional, and it’s not exactly obvious when this is the case. What if you’re just not doing it right? Should you go any find a staff person to find out if you’re just being dense, or maybe your eyes aren’t working right? Only later did I determine that it seemed like they count the rooftop as a floor of fun. Gotta be honest here, it didn’t seem like there was enough up there to count, but whatever. It was only mildly misleading, not a deal breaker. I would not recommend visiting this on your own. There are many things that are only interesting if you have a buddy to operate some devices with, or at least some friends to laugh about the illusions with. The price of around £14 for an adult is not terrible, but it’s not amazing value either. I really enjoyed this place. I think children would also really like these things if they are interested in visual trickery. (this should be all children fyi) It did help that I didn’t really have any high expectations for this place, so I was just consistently ‘pleasantly surprised’ by how many things I liked. I might be just easily pleased by colourful things and all that, but if you’ve never been to a place like this, do it! p.s. If you didn’t know, I’ve been shoving Magic articles over to my friend’s website recently. I am still going to write about cards here too, but if you’re into standard ramblings, they will mostly be over here. Here’s the latest one.